“Flat Jesus” is a concept based on the children’s novel “Flat Stanley” where Stanley is accidentally flattened when a bulletin board falls on him. What Stanley quickly discovers though is that being flat has some incredible advantages! He can go to all kinds of places that he couldn’t go before! Children in elementary schools were given their own paper cutout of Flat Stanley (early 90’s) and took him to all corners of the world on countless adventures. Friends and family took him on holidays, invited him to community events, family gatherings, the possibilities were endless. They would take a picture of themselves with Flat Stanly wherever they were, doing whatever they were doing, write a few short details about their adventure and the adventures of Flat Stanley grew. Flat Jesus is a twist on Flat Stanley. 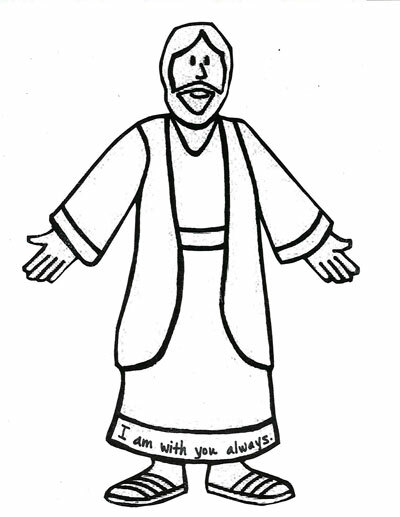 Church of the Redeemer parishioners have been invited to take a cutout of Flat Jesus, colour/decorate him, and take him with them throughout the summer, sending pictures and stories back to the church. What a great way to share our faith and remind us that Jesus is with us wherever we go. An outward expression of an inward faith. Keep an eye out for pictures of the adventures of Flat Jesus on Facebook! I’m pretty sure one of the adventures will be to Tarime in Africa! July 3, 2014 in Ministry, Miscellaneous. ← St. John’s Back to Basics: See you in September!